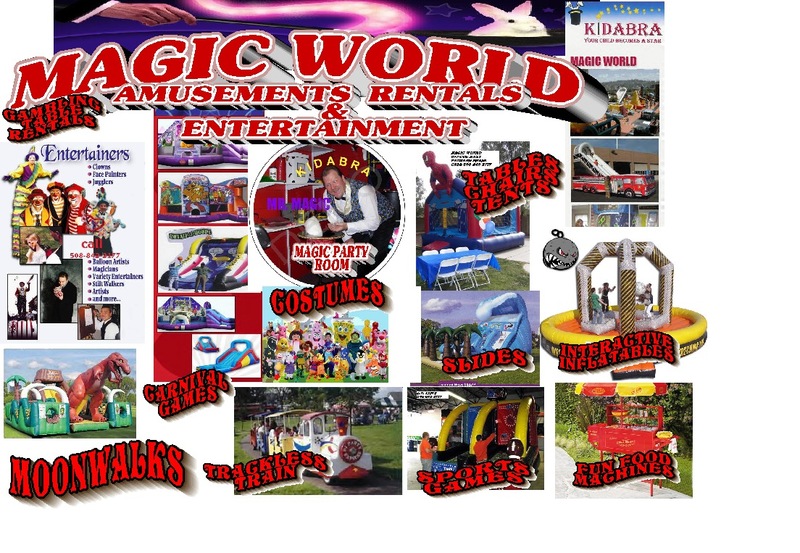 Magic World is a full service Amusement, Party Rental and Entertainment Company. We service all of Central and Eastern Massachusetts. We offer the best in family fun. Birthday's, Church events, Company outings, Elementary -High school-College Spree days, Grad party's, Weddings. You name the Event and we will Deliver the Fun!. We rent Moonwalks, Interactive Inflatables, Slides, Dunk Tanks, Sports Games, Carnival Games, Cotton Candy, Snow Cone, Popcorn, Nacho and Hot dog Machines. We rent over 3000 Costumes, Tables and Chairs, Sound systems, Karaoke Machines, Fly Guys and Generators. We offer over 75 Entertainers That Include-D.J's, Magicians, Clowns, Hypnotists, Mimes, Jugglers, Puppeteers , Rag time bands and much much more. Have Your Childs Birthday at Magic World Party Rooms Called KIDABRA a Magical themed Birthday where your child is the STAR! Just go to our Home page and click Online Catalog for all the Fun things we offer. Remember "You deliver the people and we will Deliver the Fun"!